The woods are lovely, dark and deep, But I have promises to keep, And miles to go before I sleep, And miles to go before I sleep. This verse came to mind when I visited the exhibition at the library of the London School of Economics (LSE) entitled Endless Endeavours – From the 1866 Women’s Suffrage Petition to the Fawcett Society. The show marks the 150th anniversary of the Society, which traces its origins to 1866 and the presentation of the petition. Although there is greater equality of choice and opportunity for women all over the world since the roots of the Society were established, the journey towards emancipation has miles to go; lovely though they are, our woods are still not the perfect stopping place. Gender equality doesn’t yet exist in the performing and visual arts, in the cabinet, in the boardroom, and in academia; women may not drive in Saudi Arabia. Sexual inequality and indignity towards women still strikes ‘thunder in our breast’. The carefully chosen exhibits in the exhibition, displayed in a bright, airy and minimalist space, enlighten rather than overwhelm us about the history and legacy of the British women’s movement. They reveal key events and pioneers, about which many of us are unaware. Memorabilia shows rather than tells; it’s instructive and inspires enquiry. The petition – for women’s right to vote – was signed by 1,499 women and presented to Parliament by John Stuart Mill MP. Indeed, it was not until 1928 with the passing of the Equal Franchise Act that all women over the age of 21 were entitled to vote. Initially campaigners for women’s suffrage wanted the vote for women to be on the same terms as the right to vote had originally been granted to men, that is to say one had to be a property owner before being allowed to cast a ballot. These middle and upper middle class women overlooked the plight of working class women. A glass case in the centre of the room is devoted to the history of the Fawcett Society. Among the objects we see are a leaflet representing the Federations of the National Union of Women’s Suffrage Societies (NUWSS), published in 1913. The NUWSS was notable for its peaceful campaigns and methods. Its members were known as suffragists. We also see a selection of attractive badges from different suffrage societies, a map showing how the suffrage societies were organised in 1897, a photograph taken in 1927 of Millicent Garrett Fawcett (a one time president of the NUWSS) and a ceremonial trowel presented to her. Incidentally, Garrett Fawcett co founded Girton College, Cambridge. A timeline with helpful captions reveals major moments in the history of the women’s movement for equality. For example, in 1903 women in the Manchester Independent Labour Party founded the Women’s Social and Political Union (WSPU) in Manchester. Influential members included Emmeline Pankhurst and her daughters, Sylvia and Christabel. The WSPU, unlike the NUWSS, engaged in violent actions for the right to vote. They chained themselves to railings, vandalised public and private property, including artwork in museums and galleries, disrupted public meetings, and were famed for their hunger strikes in prison. They were known as suffragettes. One surprising timeline mark was the founding in 1908 of the Women’s Anti-Suffrage League; in 1910 it merged with the Men’s National League for Opposing Women’s Suffrage, forming the National League for Opposing Women’s Suffrage. Inside a wall display, there is a bust of Josephine Butler, looking quite virtuous and reflective, by Alexander Munro, a sculptor associated with the Pre-Raphaelite movement. Butler was the daughter of John Grey, a social reformer and anti slavery campaigner. She led a successful campaign against the Contagious Diseases Acts, which allowed policemen to consider women in ports and army towns prostitutes and oblige them to be checked for venereal diseases. If deemed positive, they were locked up in a hospital until cured. (Potentially disease-carrying men were not subjected to the same conditions.) Butler was also a fervent supporter of women’s rights to higher education. Also on view is the original pamphlet for the petition, which was sent to the newspapers at the time, and a charming banner inspired by the petition. 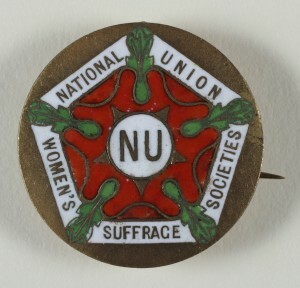 A recently discovered brooch encrusted in green, red and white jewels, the colours of the suffragists, which was presented by the National Union of Women’s Suffrage Societies to Millicent Garrett Fawcett, is also featured. Those of us who are artistically inclined may especially appreciate that Sylvia Pankhurst was a notable artist and designer; and obviously her artistic endeavours were overshadowed by her political activities. In 1907, she toured the north of England painting and writing articles about the condition of women workers. She designed banners, flags, flyers and gifts for sale in aid of the women’s movement and decorated halls and meeting rooms for associated organisations. Sylvia is credited for her symbolic representations of the suffragettes’ ideals and values, such as the ‘angel of freedom’ blowing a trumpet, and a woman sowing the seeds of emancipation. One of her most notable creations was the silver Holloway brooch based on the portcullis gate of the House of Commons, with a superimposed enamelled broad arrow (the convict symbol) in the suffragette colours of purple, white and green; the brooches were given to women who had been imprisoned at Holloway gaol. The archives of the Society are now part of the Women’s Library, which is located on the third and fourth floors of the LSE Library. The Women’s Library contains information about all aspects of women’s lives, social, political, economic and literary, with an emphasis on women living in the United Kingdom during the last 150 years. It includes 60,000 books (many of which are on the open reference shelves) and pamphlets, 3, 000 journal titles, over 500 archives and 5,000 objects such as board games, ceramics, photographs, clothing, badges and banners. On the broad concourse outside the Library, you’ll see many students and teachers of all shapes, sizes, ages, skin colours and facial characteristics walking and talking. The atmosphere buzzes with vitality. People’s sexual gender doesn’t occur to you, and that’s just the way it should be – unless of course you’re looking for a friend or a lover, but that’s another story. The image above is of a badge in support of the suffrage movement, courtesy of the LSE Library. STOP PRESS: recently, the new Mayor of London, Sadiq Khan, who in his manifesto said that he would ‘be a proud feminist at City Hall’, agreed to the placing of a statue of a suffragette in a central London public space within the next few years. His commitment followed a campaign, launched by feminist activist Caroline-Criado Perez, calling for a statue to be erected outside the Houses of Parliament. Why should all of the statues there be of men? asked Perez. The exhibition runs until the 27 August 2016. For further information, visit http://www.lse.ac.uk/library/home.aspx, http://www.fawcettsociety.org.uk; http://www.lse.ac.uk/library/collections/featuredCollections/womensLibraryLSE.aspx, and http://www.tate.org.uk/whats-on/tate-britain/display/bp-spotlight-sylvia-pankhurst (concerning an exhibition of Sylvia’s Pankhurst’ work once held at Tate Britain). Don’t miss the feature film, Suffragette http://www.imdb.com/title/tt3077214/.